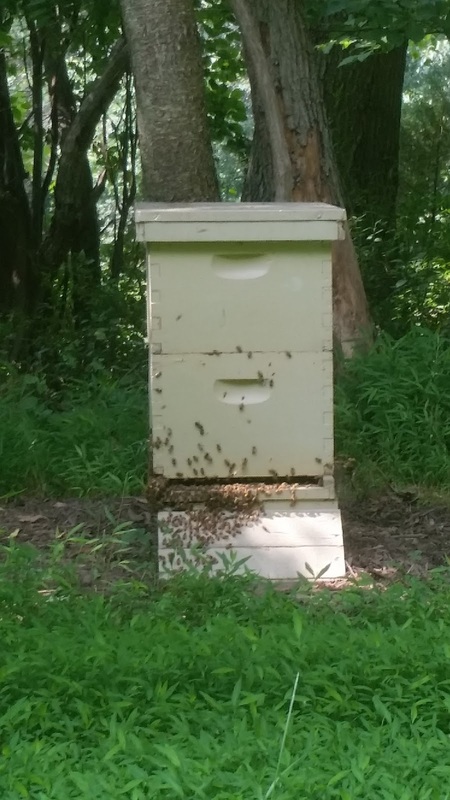 With temperatures pushing 100 degrees Fahrenheit today, it was a near perfect day to extract honey. 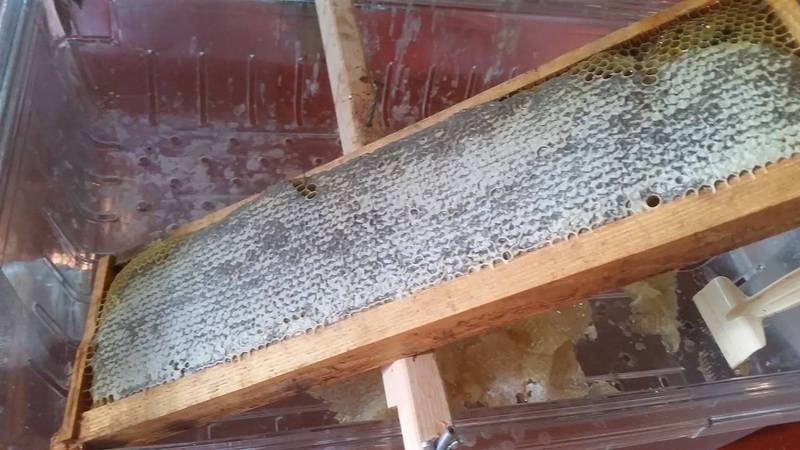 Honey supers are removed from the hive with the use of a “fume board.” This is a hive top cover lined with felt. I covered the top of it with black duct tape to allow it to get very warm in the sun and increase its effectiveness. The felt liner is sprayed with oils that repel the bees from the honey super. The product smells like almond extract. 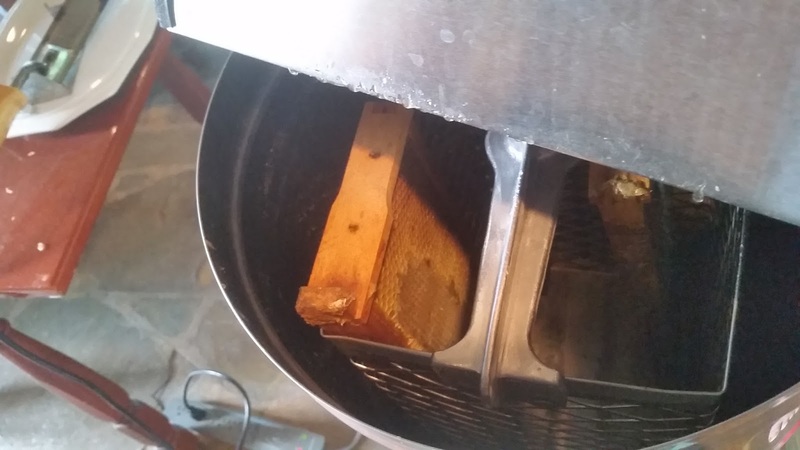 After placing the fume board on the hive, it drives the bees deeper into the lower brood boxes, and allows the honey super to be removed with only a few remaining bees. We bring the supers into our enclosed patio room (aka the brewery) and allow the few straggler bees to find their way to the door, where we shoo them home to their respective hives. Each shallow super of honey contains about 30 pounds of honey. 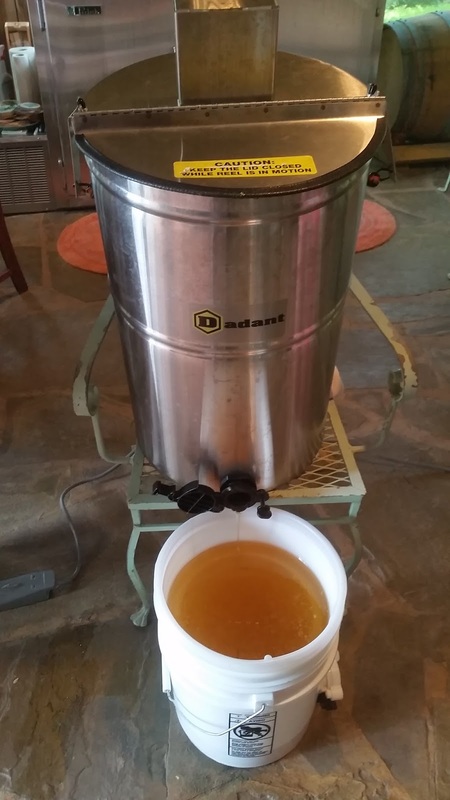 Honey is roughly 12 pounds per gallon. 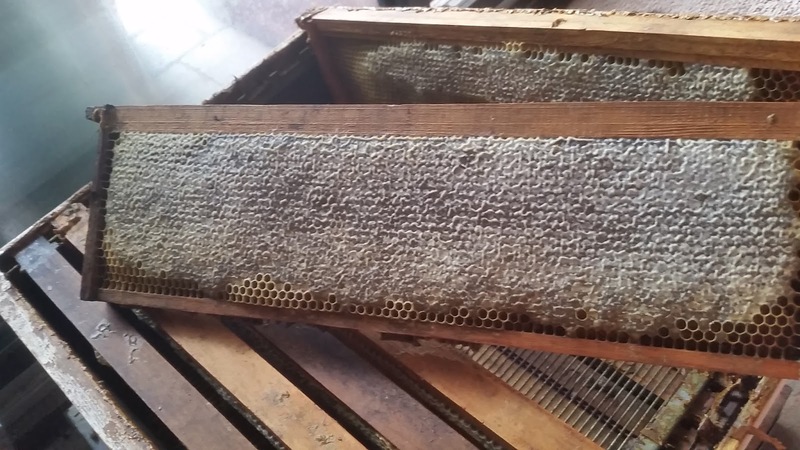 The frames of honey in a super should be fully capped, meaning each cell of honey is covered with beeswax. 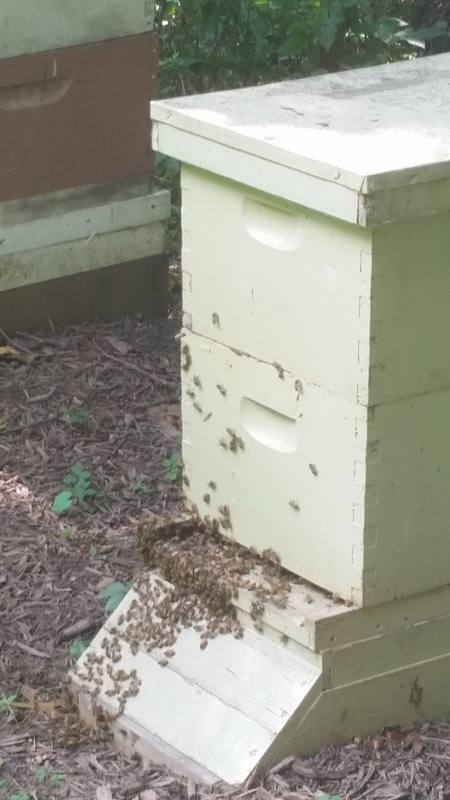 There is no bee brood in the honey super because the queen is kept below the super by a queen excluder. The queen excluder is a wire mesh that allows workers to pass, but the queen is too large to get through. She cannot get up to that level to lay eggs which would form brood. 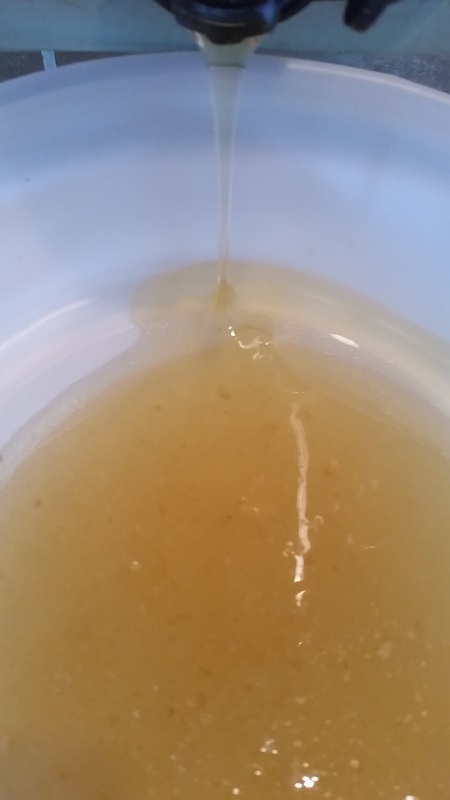 Uncapped honey is not fully ripened, so it is not extracted. Only capped honey will be shelf stable. First stop in the extraction process is the uncapping tray. 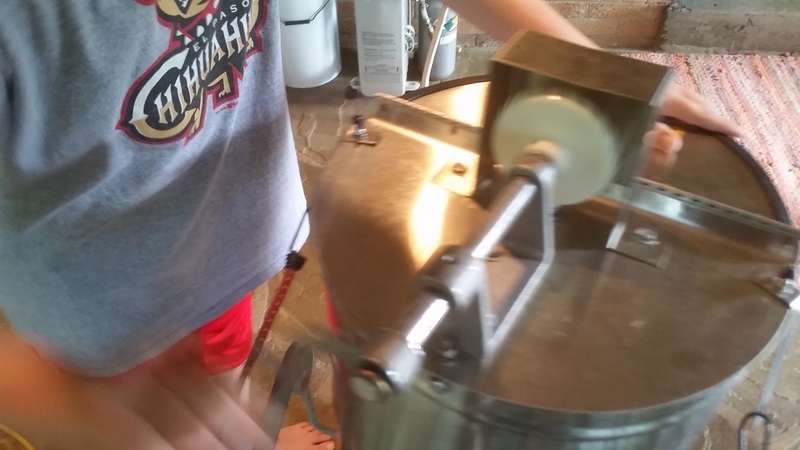 A hot electric knife is used to slice off the wax cap of the honey cells. Any cells that cannot be reached with the knife (they are too low) must be opened with the cappings srcatcher (lower right). 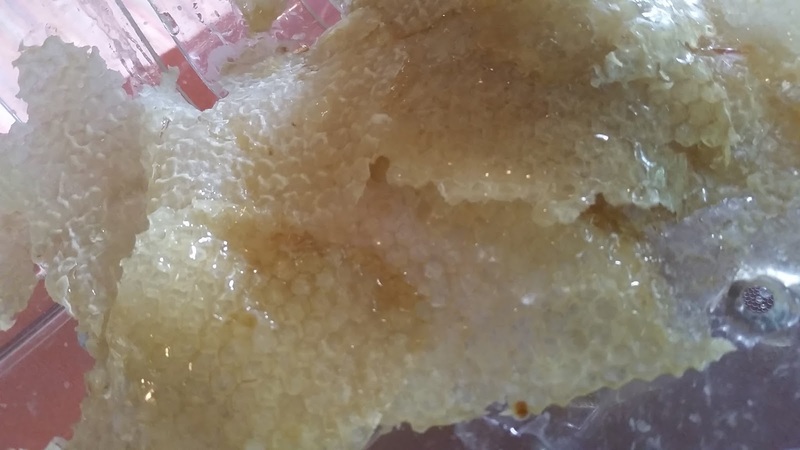 The cappings fall to the floor of the tray and any honey attached to them drips through holes to the lower level. 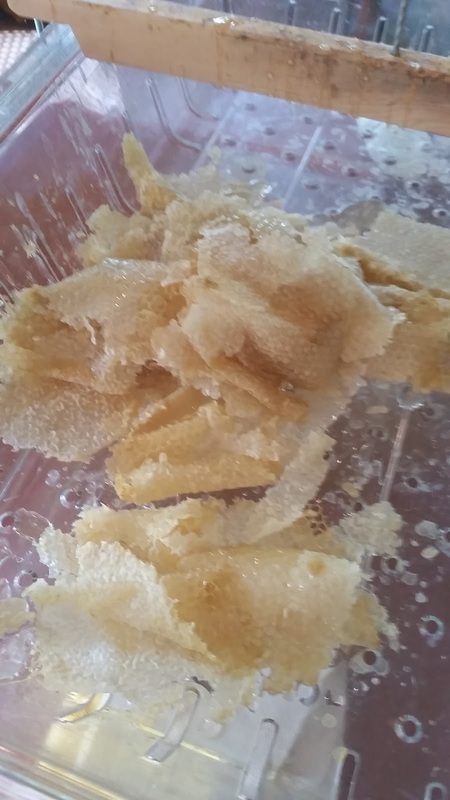 We’ll get that honey later, and we will use the wax for other projects (see Belgian Chocolate Soap). Everyone loves to grab some of this honey covered wax and chew on it, too! Delicious! 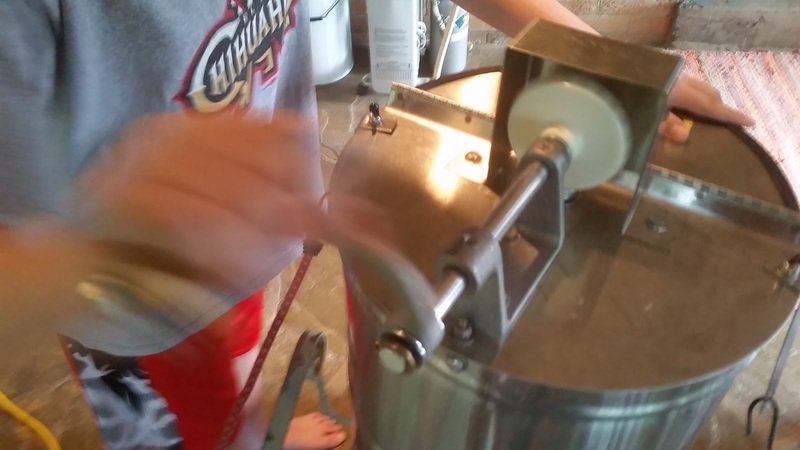 Once the frames are uncapped, they are placed in the centrifugal extractor. 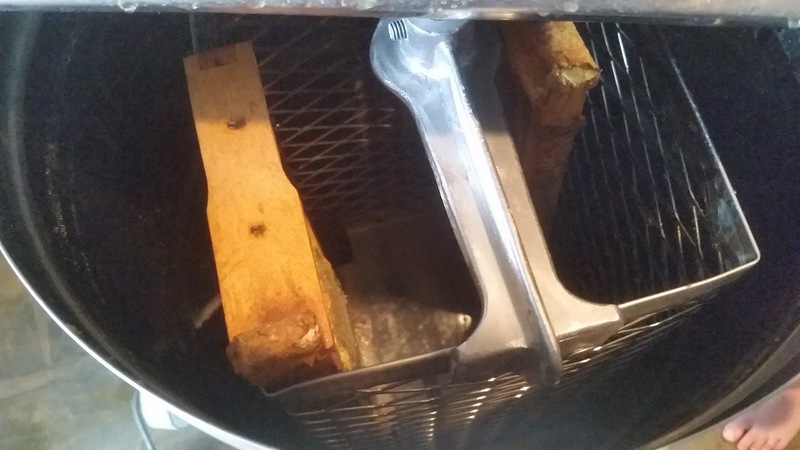 Our extractor holds two frames at a time. 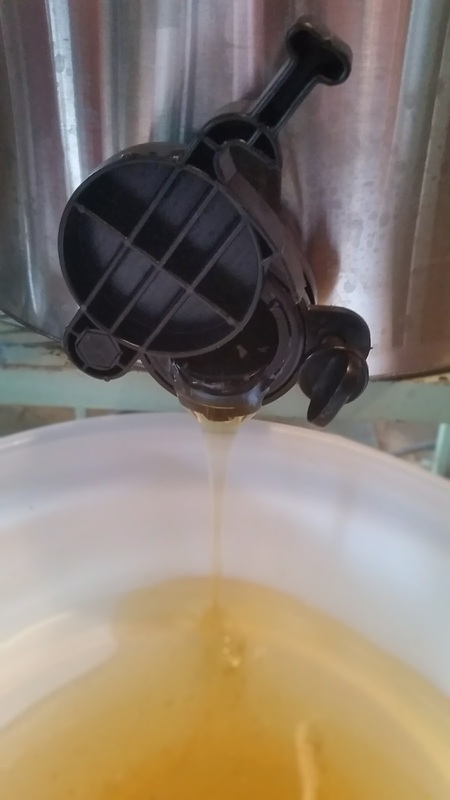 The crank is turned and the honey is forced from the frames’ cells, and drains to the bottom of the extractor. 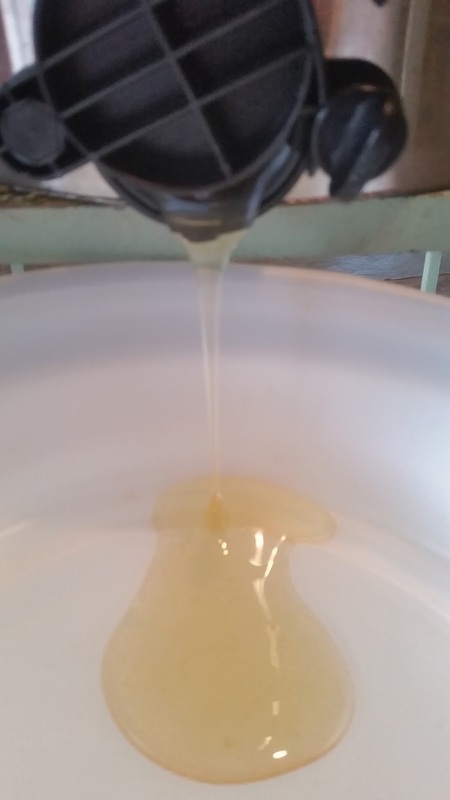 Eventually the level of honey hits the bottom of the spinning cage, and the extractor must be drained. 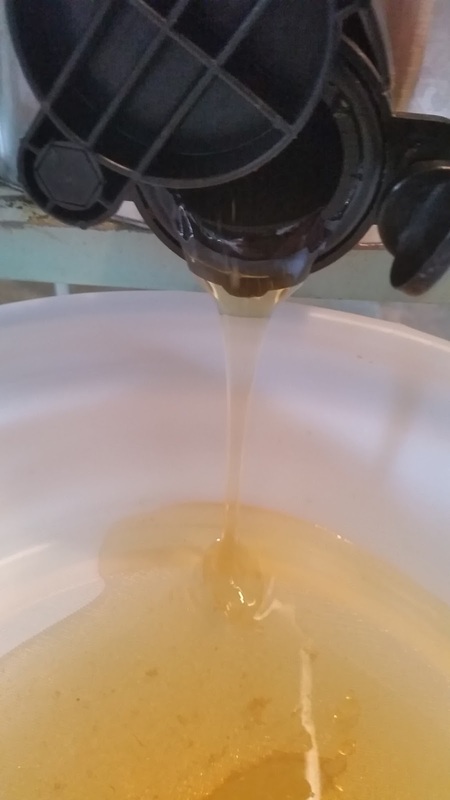 The gate is opened, and the honey flows into a waiting bucket topped with filter mesh to catch any particles and bee parts. That is some great looking honey!! 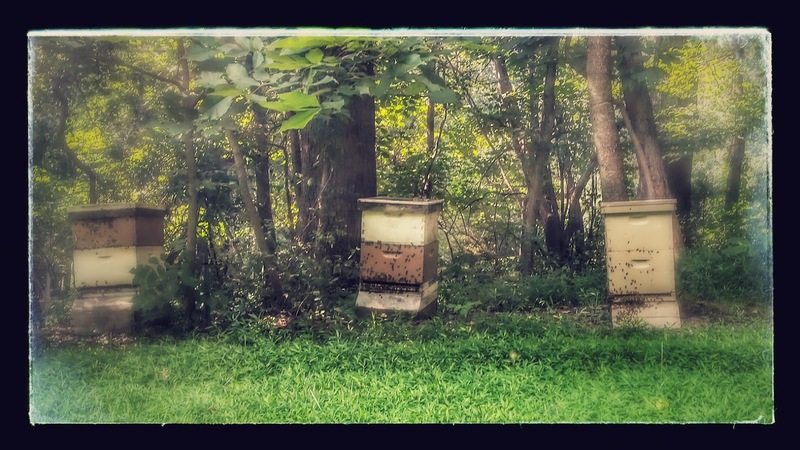 The bees are already back to work getting ready for winter, and gathering more nectar and pollen from late summer wild flowers.